David Adams the farmer and owner of Falkeham Saltmarsh on the River Deben in Suffolk first approached the Deben Estuary Partnership in 2011 with a proposal to work with him upon a scheme to stabilise the site. 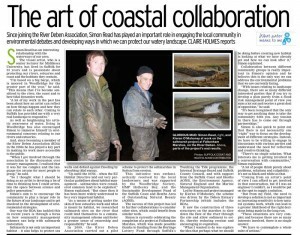 This was a tremendous opportunity to extend the discussion that we have actively been conducting since 2009 over whether it is feasible to restore and manage saltmarsh that already exists as a parallel strategy to the creation of new intertidal habitat through the process of managed realignment. At the midpoint we built a barrier up to the level of the surrounding saltmarsh to prevent the tide flowing through from top to bottom. At the southern end by Felixstowe Ferry we built a similar structure but this time to act as a sill to allow the tide in on the flood in a controlled way and by limiting the flow, encourage the deposition of silt on the ebb. 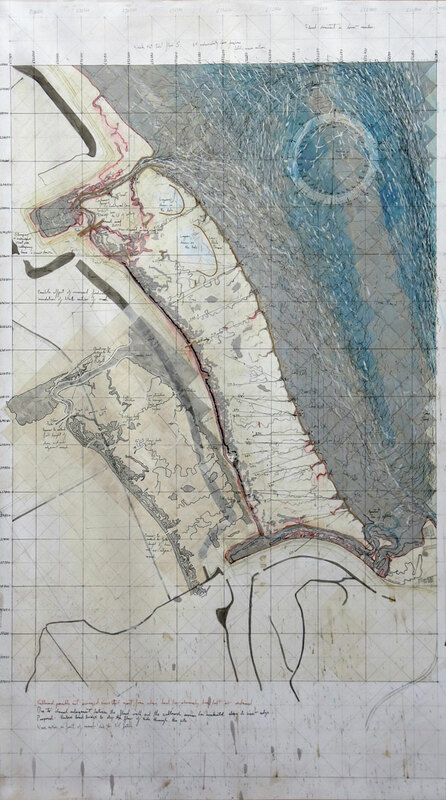 At the northern end of the channel, we had a more complex challenge, which was to manage a deeper channel system over a larger area and to provide mitigation for the negative effect of the pumped outfall from Kings Fleet upon the surrounding saltmarsh. 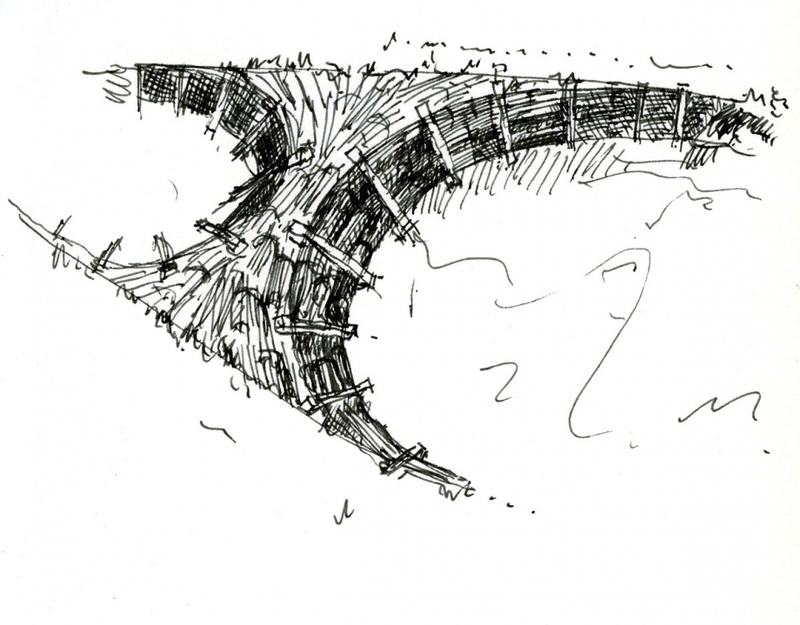 We conceived this as a more elaborate structure in the form of an arc that spans the two principle channels draining the marsh, but still operates as a sill to allow the tide in and to encourage the retention of sediment. The three structures are designed to work as an integrated system. 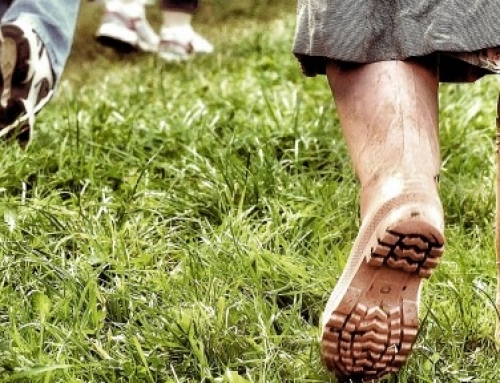 They are all “soft engineered” of timber, brushwood, straw bales, coir and a great deal of sweat! 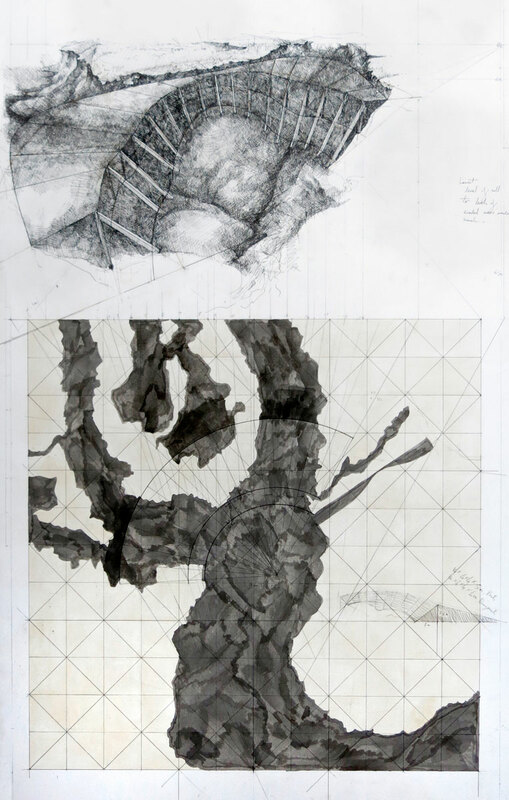 The intention is that if the plan works and the site is given a chance to regenerate, in the fullness of time the structure will become absorbed into the marsh and, also in the fullness of time, it will eventually decay. We have been lucky that this project has attracted generous support from Suffolk County Council, the Heritage Lottery project “Touching the Tide”, the Internal Drainage Board and of course from David Adams, the landowner. This has allowed us to resource it properly and to engage a Project Manager, Kieran O’Mahony and the indispensible help of Allden Owles and Rob Mortley. Simon Read: Project Leader and Designer. Simon Read has been planning and coordinating this project from its inception. 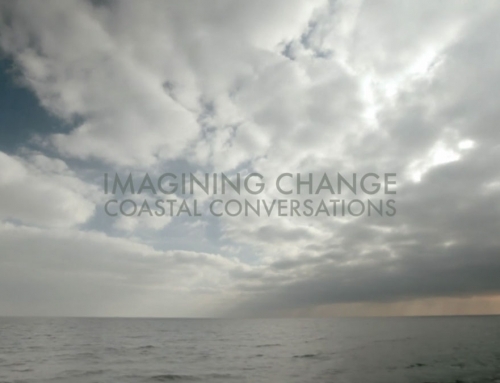 It is very much an extension of previous work carried out on the estuary, in that it proposes a role through practice of holding a conversation with natural processes and through this, it fosters an enhanced understanding at a community level of how estuarine systems work. 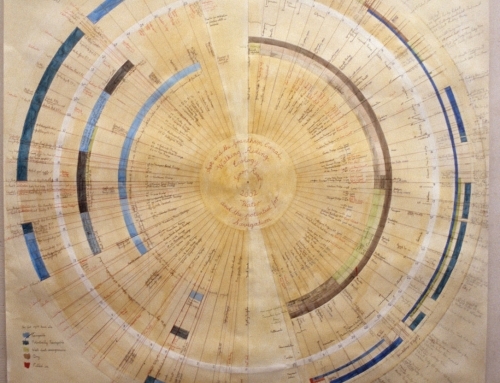 He strongly believes that the challenges we currently face over environmental change are sufficiently nuanced and complex to deny the application of singular solutions. For this reason he has devoted his energy towards developing an understanding of the cultural implications of change and the role that the cultural community has in re-assimilating societal perceptions of land, ownership, responsibility and belonging. 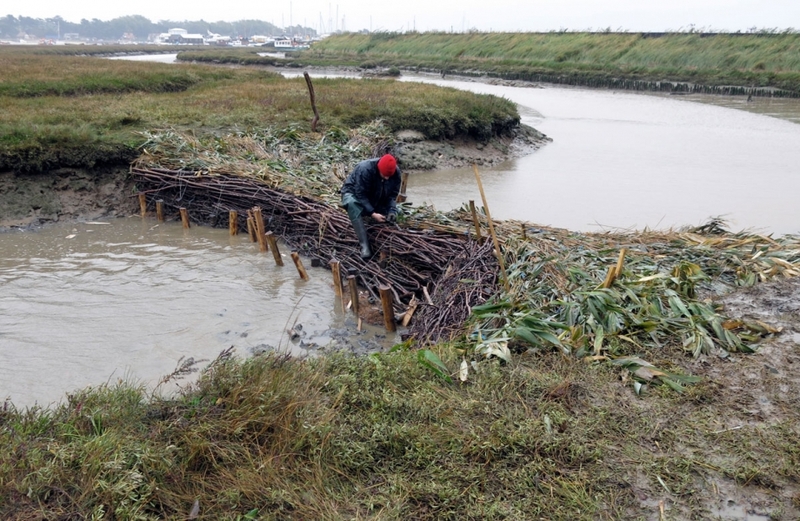 By setting up the Sutton Saltmarsh tidal mitigation barrier initiative in 2009, the RDA challenged the principle of habitat creation through managed realignment by proposing an interim and alternative strategy of habitat management. 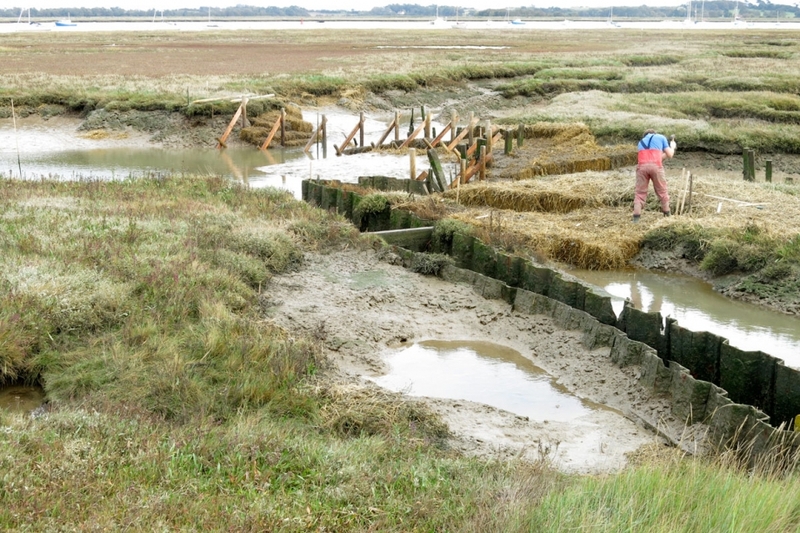 Since then, the Deben Estuary Partnership have picked up the challenge, with an ambitious project to arrest the loss of saltmarsh in the flooded field below Sutton Hoo in 2011 and now to manage the fringing saltmarsh at Falkenham between the outfall for Kings Fleet and Felixstowe Ferry. We started discussing this project with the landowner in 2011 and it has taken until now to have developed and agreed a mature plan. 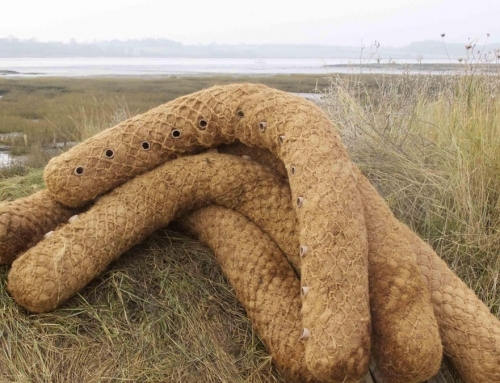 This project is a unique partnership between an enthusiastic landowner and the Deben Estuary Partnership and is fortunate in having attracted funding from the Heritage Lottery project ‘Touching the Tide’, Suffolk County Council and the Internal Drainage Board. This week, beginning 9th September 2013, we finally received all of the permissions necessary to carry out structural work on site. Originally we responded to an invitation from the landowner to develop a plan to address serious depletion of the saltmarsh especially at its Northern end where the outfall pump for Kings Fleet is situated. Like all of our saltmarshes, there is a range of factors that combine to cause deterioration; although we agree that there is no single culprit, increased tidal flow through the site particularly along the delft between the defence wall and the main body of the marsh has caused severe erosion that if left to its own devices will eventually cause the fragmentation of the site. 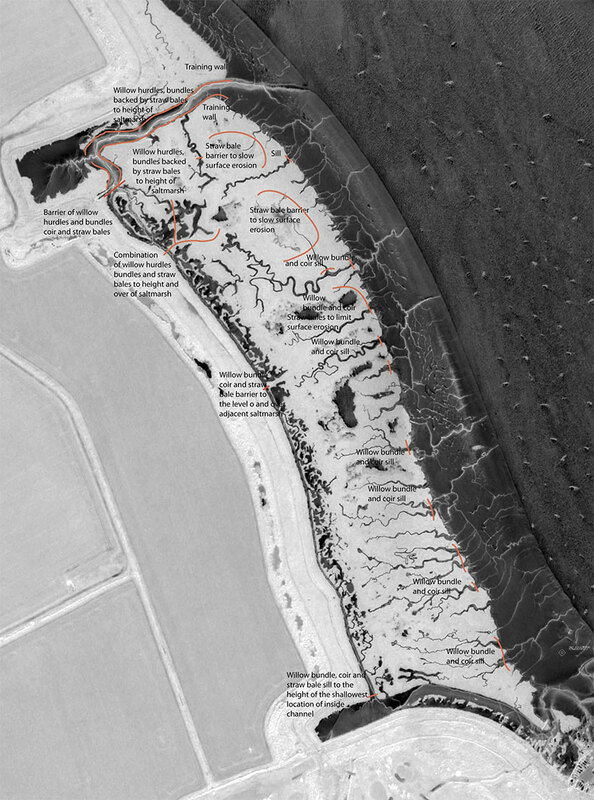 It is likely that increased frequency of pumping from Kings Fleet over recent years and the gradual collapse of the engineered channel are contributing to the draw down of the marsh in the immediate vicinity, but it is certain that where the tide penetrates the site from the northern end where the channel system is deepest, it washes out more material than it deposits. Our proposal is to build three main structures to control the tidal exchange through the delft between the marsh and the flood defence wall: we are starting at the mid point of the delft channel where historically the saltmarsh was joined to the landward side to form an access via which the farmer could graze livestock on the marsh. This small ‘land bridge’ is clearly marked on the early 20th century Ordnance Survey maps and would have reduced the amount of tidal erosion by limiting the flow through the site. Since then it has disappeared with the effect of allowing the tide to flow freely north to south behind the saltmarsh. Our intention is to duplicate the effect of this ‘land bridge’ with a barrier constructed from straw bales and brushwood bundles. This will be to the height of the crest level of the saltmarsh and is intended to allow the tide in but to definitively stop it from flowing dynamically through the site. At the northern end of the site where the channel for the outfall from Kings Fleet drains to the river, we have designed a structure that will have two functions, firstly to restrict the flow of the tide into the channel complex of the marsh and secondly to mitigate the effect of the pumping operation. 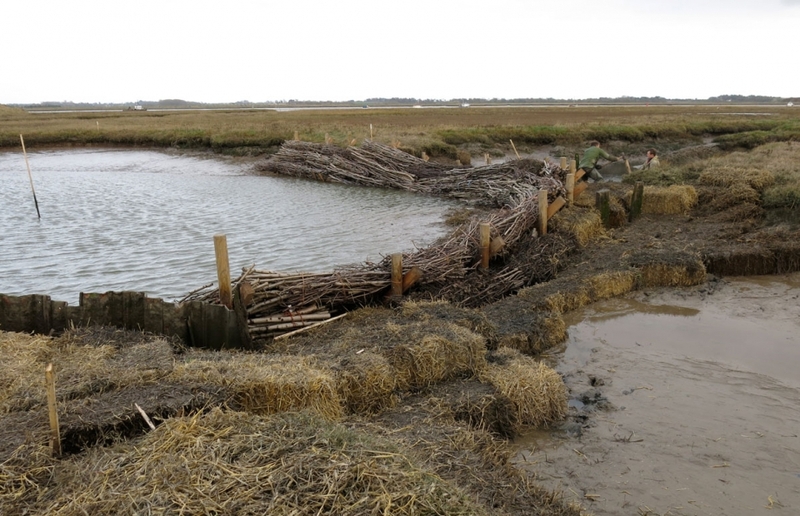 This will be a barrier in the form of an arc about 27 metres in length to the height of the adjacent saltmarsh but dipping to echo the profile of the two creeks that are fed by and drain into the Kings Fleet Outfall channel. This will simultaneously allow tidal ingress and outflow but limit the rate of tidal exchange and hopefully promote sedimentation. Again, this will be a ‘soft engineered’ structure of timber, brushwood, coir matting and straw bales. At the southern, Felixstowe Ferry, end of the channel, we intend to install a tidal sill also made of timber, brushwood, coir and straw bales. The form will be similar to that of the structure near the Kings Fleet Outfall but the intention is to slow the tidal flow as it ebbs and therefore restrict the loss of sediment and promote accretion. At its centre the sill will be to the level of the channel bed where it is shallowest at its mid point where we have planned the barrier to the full height of the adjacent marsh. We also intend to place further small obstructions to impede flow within the site but these will be responsive to the observed effects of the three main structures and will be an opportunity to experiment. The agreement is that the work should be completed by the beginning of November. So equinoctial gales permitting, the clock is ticking! As with the other two projects we have set up at Sutton (RDA) and Sutton Hoo (DEP), the principle of the project is to explore the potential to stabilise intertidal habitat, without which we will experience disastrous loss of biodiversity on the river and crucially would place our earth embankment flood walls under increased stress from tidal action. This is a relatively new science and it is a privilege to be able to contribute to current knowledge and methodologies in a way that is responsive to particular conditions on a site-by-site basis. We know that all of our saltmarsh stock is under stress and we know that this is due to a combination of factors. To this end we have set up a monitoring programme for each site and we are actively promoting research into the causes of saltmarsh loss, towards which the work that we are conducting will act as valuable case study material. The Environment Agency pay the Internal Drainage Board £5000 per annum as upland water contribution for the electricity consumed by the pump. The land inside the wall at Kings Fleet is 0.7 metres OD. The marsh to the west of the sluice is approximately 0.5 metres higher than the mudflat. Possibly due to localised scour at the pump outfall, the sheet piling lining one side of the channel is collapsing. 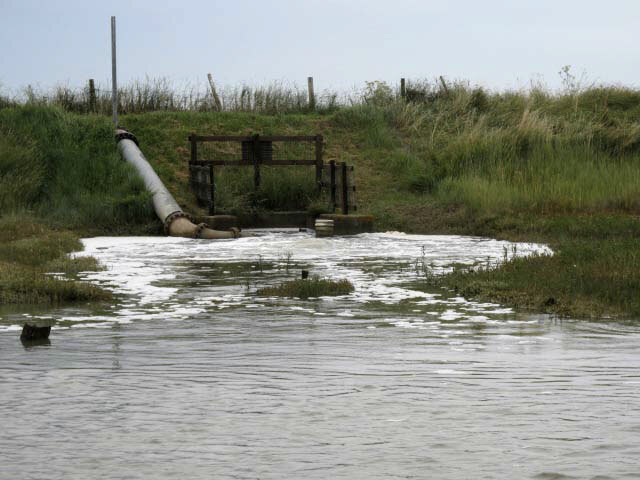 Discharge from the pump is much quicker than it would have been via the sluice, consequently the effect it has in the immediate vicinity is correspondingly greater, causing draw down, erosion and collapse of the adjacent salt marsh. In recent years the channel bed immediately adjacent to the sluice has been raised using compacted straw bales. This was carried out by the landowner, David Adams, who placed six one metre high bales, stacked two bales high. This work was completed in 2001 and within three years had been covered by sediment. The aim of this was to concentrate the outflow from the pump to scour the channel, this has been partially successful but now the marsh drains on the ebb via another route. The salting is subject to erosion along the entire length of the inner channel, opening up a patchwork and network of ponds and subsidiary channels. In turn, this has increased the flow through the site, scouring deeper channels and promoting erosion slumping of the immediate salt marsh areas. 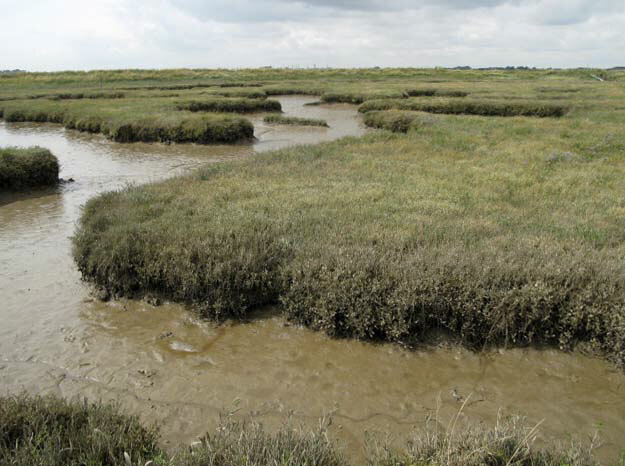 Due to the increase in flow through the site, constituent areas such as a mudflat next to the outfall from Kings Fleet is losing sediment, placing its fringing saltmarsh under stress. Historically, midway along the inside channel, there was a land bridge that was used for driving sheep on to the saltmarsh for grazing. This no longer exists but betrays its presence as a high point that separates the direction of drainage of the marsh equally upstream and downstream. The frontage of the marsh, although relatively stable due to its position relative to the main tidal channel, has lost approximately 20 metres over about 40 years, but has kept the same approximate configuration. The land protected by the wall is too low to drain by gravity and the outflow channel does not scour sufficiently to make the sluice arrangement operable, necessitating the use of a pump. The entire site is becoming degraded through incremental loss of salt marsh material. The flow of water through the site, both through the land drain and tidal action has had an incremental increased effect upon the state of the site that will only become greater with sea level rise. Extend the outflow point from the pump by pipe to the outer edge of the saltmarsh. Break down the flow through the length of the inside channel by restoring the land bridge at its centre. Limit inflow from the tide by stopping fully or partially the inside channel at both its upstream and downstream ends. This could be either a sill, a barrier to the height of the existing marsh or a sill with a pipe through at the centre to alleviate pressure on the ebb. Place brushwood barriers in those drain channels caused or enlarged by erosion. Disrupt the flow of tide through the mud flat next to the outfall. Compacted strawbales, Timber fence with brushwood and geogrid groyne works, pipework extension to the outfall pump. Trazar Astley-Reid, Simon Read, November 5th 2011. Saltmarsh Condition Survey, to 2007, Natural England. Data on flows at the entrance and lower reaches of the Deben. Environment Agency. 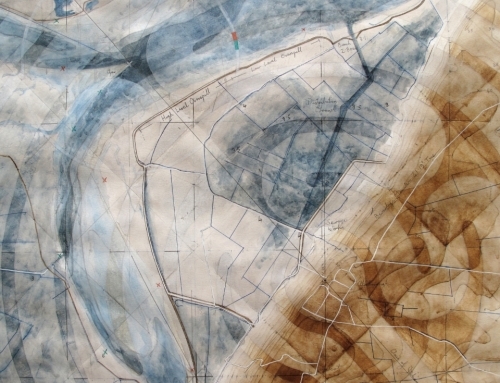 The OS maps do not give a great deal of reliable information since, apart from known changes at the outflow from the pump at Kings Fleet and at the lower end of the marsh at Felixstowe Ferry due to reclamation works, in all other respects it is evident that the profile of the saltmarsh has not been surveyed. Both Google Earth and the Lidar Surveys do show substantial differences however. There is loss of material along the entire riverside edge of the marsh although towards the Felixstowe Ferry end there is some slight evidence of accretion. The greatest loss of material occurs at the downstream end adjacent to Felixstowe Ferry and at the upstream at the outflow from Kings Fleet. An increase in standing water in the body the marsh due to apparent slumping, effecting the range and variety of saltmarsh vegetation. An increase in the width of the channel that separates the marsh from the river wall and associated opening up of tidal pools and new channel systems. A new channel has opened up adjacent to and bypassing the one that Mr Adams had restricted with compressed straw bales in 2001. It appears from this that unless the amount of water flowing through the site on the tide is limited, there is no easy solution to the continued scour. The Lidar material also interestingly shows a difference in level between the saltmarsh and the drained land behind the seawall where the drained land is up to 0.3 metres lower. 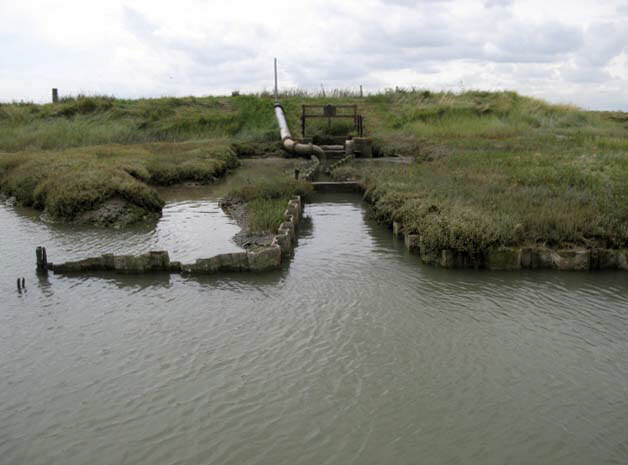 The survey material shows that the channel that passes between the Horse Sand and Falkenham Saltmarsh shallows to 1 metre or less at low water springs towards Felixstowe Ferry. The flow data support this by revealing very weak flows through the channel. Both flood and ebb tide pass mainly on the Bawdsey side of the sand with a slight downsteam flow on the flood as a back eddy and a minor downstream flow on the ebb. The absence of dynamic tidal flow across the front possibly accounts for minimal loss of material over the greater part of the last century. The relative stability of this saltmarsh in relation to its protected position, makes it an appropriate candidate for a light touch project. There is evidence that slight increase in sea level coupled with isostatic change may be promoting loss of some saltmarsh vegetation and slumping in the body of the marsh. The incremental erosion of the inside channel has promoted erosion and has consequently increased the amount of water passing through on every tide. This can only increase if it is not addressed and will certainly lead to the disintegration of the marsh from the inside. The pump out from Kings Fleet is exacerbating the draw down of the marsh in the immediate vicinity. This could be just a local effect and I have been assured that rather than making the channel that drains to the river deeper, it does in fact have the tendency to silt up. To this end, the landowner has in the past dredged and straightened the channel. There is some concern over the sheet piled channel leading from the pump outfall to the saltmarsh channel. This appears to be subsiding and needs to be addressed through the IDB. The marsh needs to be studied closely through the tidal cycle and especially when the pump is in operation. It would be helpful to engage the opinion of a saltmarsh specialist upon what the drivers for the deterioration of the marsh could be. The potential for stabilisation work needs to be explored with the landowner, Mr Adams, Environment Agency, Natural England and the IDB. Restrict the tidal flow through the site by restoring the land bridge in the inside channel and possibly limiting the ingress of tide at either end. Material from the cleaning of the land drains could be considered but this would possibly have to be subject to analysis. 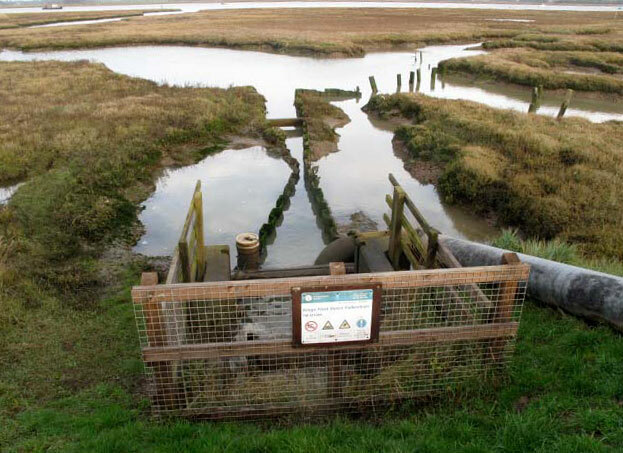 Place barriers in the main drainage channels from the saltmarsh to retain sediment and prevent accelerated loss of material through drainage. Beneficial use of dredged material for recharge would be desirable but there is not such a great call for foreshore management on the lower reaches of the river as there is at the Woodbridge end. Therefore the emphasis must be placed upon maximising the retention of tidal borne sediments. Manage the discharge from the pump at Kings Fleet and repair of sheet pile gutway. This would probably be considered too expensive to redirect to another site and is the responsibility of the IDB/ Environment Agency. Introduce soft groyne works to limit the effects of the tide along the outer edges of the site. We have potential funding from EA, matching fund from “Touching the Tide” and support in kind (labour and plant) from Padams & Son. 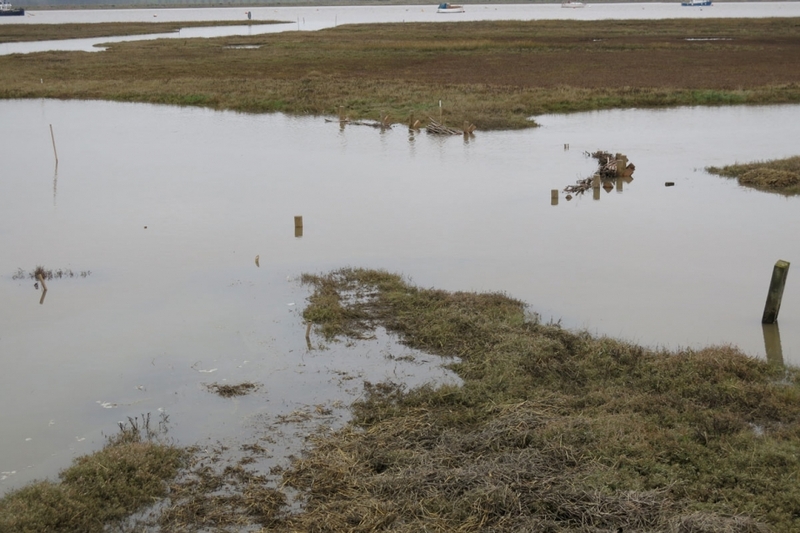 If there is further need for labour, we can explore availability with HMP Hollesley Bay Colony, who have collaborated in a previous project at Sutton Salmarsh, 2009.
of the marsh and the extent that it is being eroded through tidal action. There are at least five extensive surface lagoons left behind by the tide mostly at the northerly and central areas. Of these, two at the northerly end have been significant enough as bodies of standing water to appear on the Ordnance Survey Map. It is difficult to know whether these have increased in size or number since the 1920’s or whether they were just not recorded. There appears to be an orange mineral deposit in these areas and a range of vegetation limited to Samphire, Sea Aster and some tussocky Sea Lavender. The southern end of the marsh appears to be higher elevation and therefore has much more extensive saltmarsh grass and Sea Lavender coverage. There are some well‐established channels reaching well into the body of the marsh from the river side, of these there are no more than four that could threaten to extend, join up and subdivide the site. None of these channels correspond to or link up with the lagoon areas. In two places these channels are within 12‐15 metres of joining up to the areas eroded from the channel between the flood defence wall and the body of the marsh. Increased tidal flow between the marsh and the river wall continues to incrementally break down the saltmarsh, this is identifiably a different process from the apparently harmless effect of tidal ingress from the front. This process could be exacerbated by the “draw down” effect of the pump out of large volumes of water from Kings Fleet. The channels in the immediate vicinity of the pump are significantly enlarged and deepened. There is some risk that the eroded area on the inside of the marsh might eventually meet the channel systems extending inwards from the river. If this were to happen the result could be that the tide will then be able to flow dynamically through and start washing material out promoting the breakdown of the marsh in a way that has already been seen to happen on other sites. The channel that connects the sluice and pump at Kings Fleet to the river is very deep, at least 2 metres below the crest level of the marsh. As a result, the main ingress and outflow through the channel between the marsh and the river wall is from that end. This is in spite of the decreased level of the bed of the channel towards the point where historically a neck of saltmarsh no longer extant, separated the channel draining it to the north and to the south. The area immediately adjacent to the pump and the sheet pile structure leading out into the main drainage channel at the north end is rapidly deteriorating. The sheet pile is collapsing and has been jacked apart and held in place by a baulk of timber, however the saltmarsh either side of it has slumped and washed out to the extent that when the pump is in operation at high water, outflow has a strong circulatory effect exacerbating loss of saltmarsh material in the immediate environs. 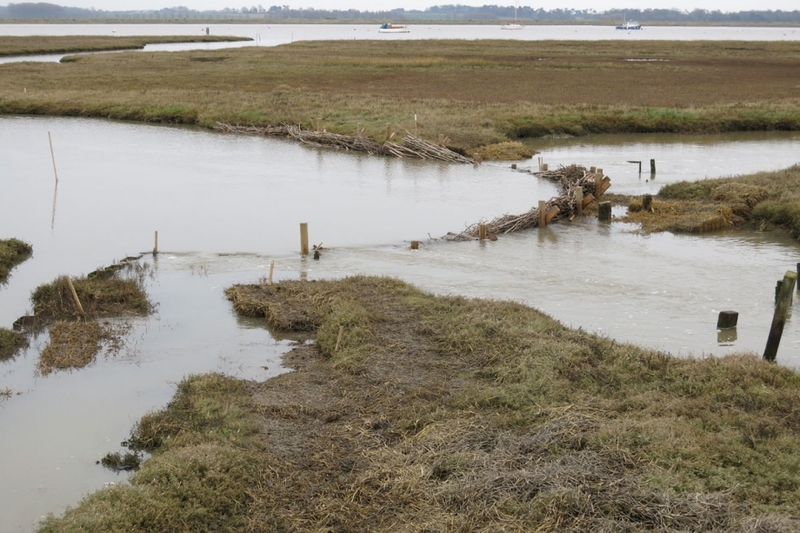 There is no longer a sluice outfall at the Felixstowe Ferry end of the marsh and as a consequence it could well be silting up there, although there is a complex of saltmarsh islands that have decayed substantially over the past two decades. The channel that passes between Horse Sand and the Saltmarsh becomes shallower towards its southerly end reflecting the underlying weak tidal flow at that point. Both on the flood and the ebb the tidal action is diverted over towards the Bawdsey shore by Horse Sand with the effect that the tidal filling to the west is in the first instance southwards around the upstream end of the sand towards Felixstowe Ferry. Upon the ebb, the flow finally resolves itself in a northerly direction, going out the way it came in. The Horse Sand is a flood tide delta formed by sand falling out of the system as it enters the estuary and becoming sculpted by the tide both on the ebb and the flood. The sand has moved further east in recent years, increasing the amount of mudflat to the west and possibly exacerbating the accumulation of silt on the mudflat in front of the saltmarsh. Address the uninterrupted flow of tide through the inside channel by restoring a solid bund at the site where there was originally a “land bridge” between the river wall and the saltmarsh. Place intermediate sills to encourage the deposition of sediment at further locations within the inside channel complex. 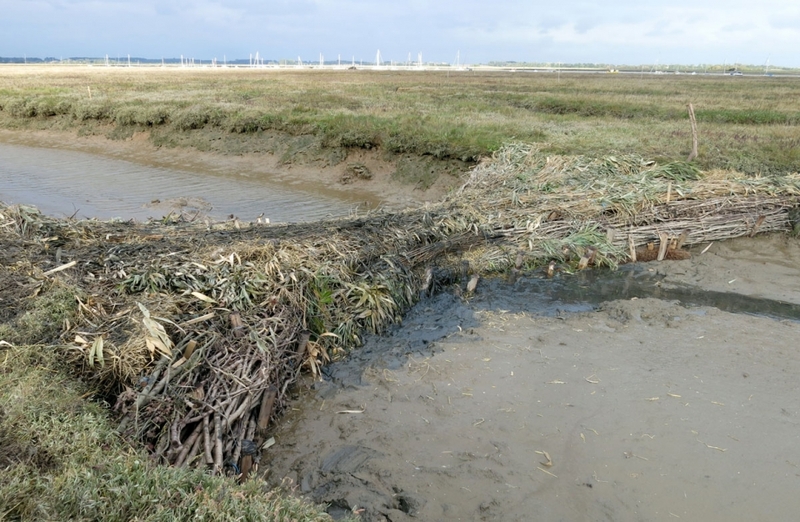 Attenuate tidal action in the enlarged channel system in the vicinity of the drainage pump for Kings Fleet using a combination of straw bales, brushwood bundles and coir bundles, held in place by stakes. 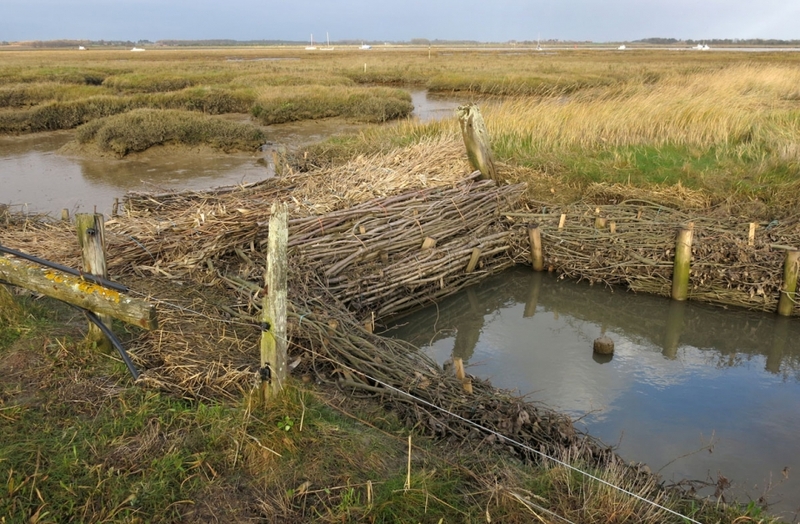 Restrict flows from the main channels penetrating the marsh from the pump drainage channel and from the river side of the marsh using low sills of straw bales, brushwood and coir, held in place by stakes. There are no more than four of these channels. Address the effects of the pumping operation upon the immediate saltmarsh area: collapse of the sheetpile channel structure and washing out the saltmarsh with potential impact upon the integrity of the river defence wall. 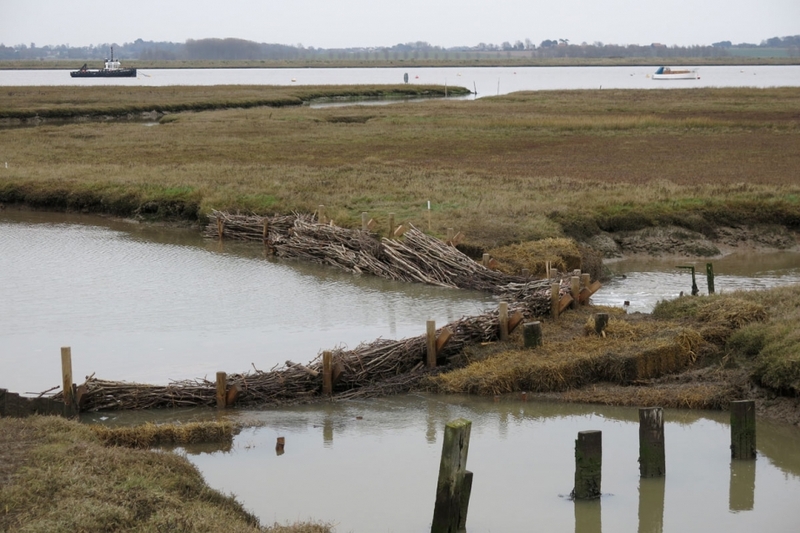 Proposals for management works on the saltmarsh between Felixstowe Ferry and Kings Fleet on the River Deben, Suffolk. 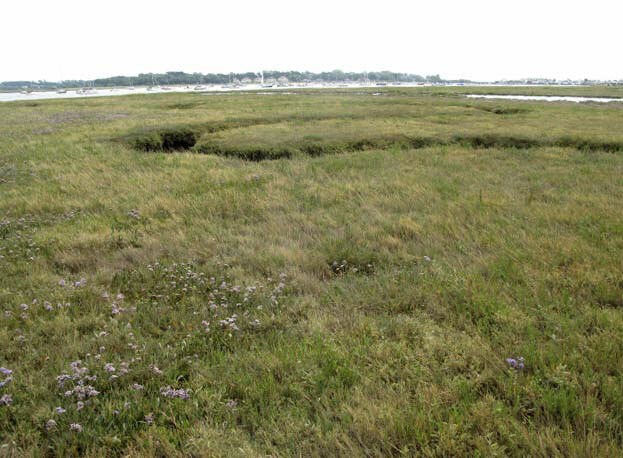 This is a large area of fringing saltmarsh that, although at present in a relatively healthy state, is showing signs of stress that if not addressed within the very near future, will inevitably lead to its break down. Sea level rise is a significant contributor to all of the symptoms for change identified within this paper. 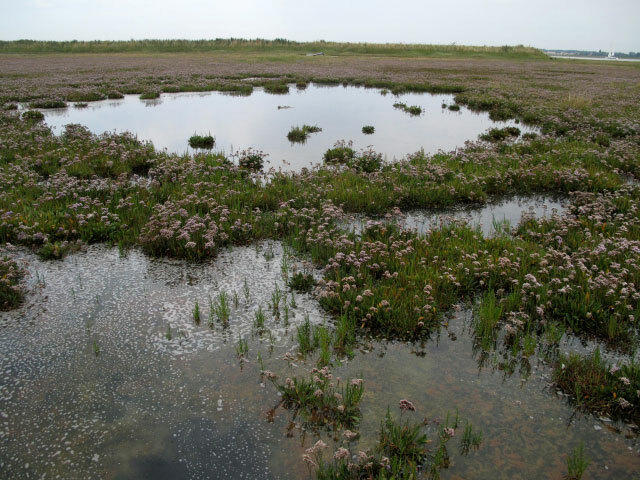 There is evidence that the saltmarsh is not accumulating enough sediment to keep up with incremental sea level rise, with the effect that some mid range vegetation such as saltmarsh grass, sea lavender and sea purslane are giving way to pioneer species such as Cord Grass, Samphire and Sea Aster. The marsh is separated from the river defence wall by a continuous borrow]dyke channel. The remaining link between the saltmarsh and the flood defence wall has disappeared within the last 50 years, allowing the tide to flow through uninterrupted. As a consequence the saltmarsh has become substantially eroded along the entire fringe of this channel, increasing the volume of water passing between the flood defence wall and the saltmarsh on the tide and therefore exacerbating the effects of scour. The erosion is greater towards the outfall from Kings Fleet in the northern section, where the saltmarsh has become dissected by enlarged and converging channels to such an extent that in parts it has diminished to a vestigial form of freestanding banks and isolated islands. 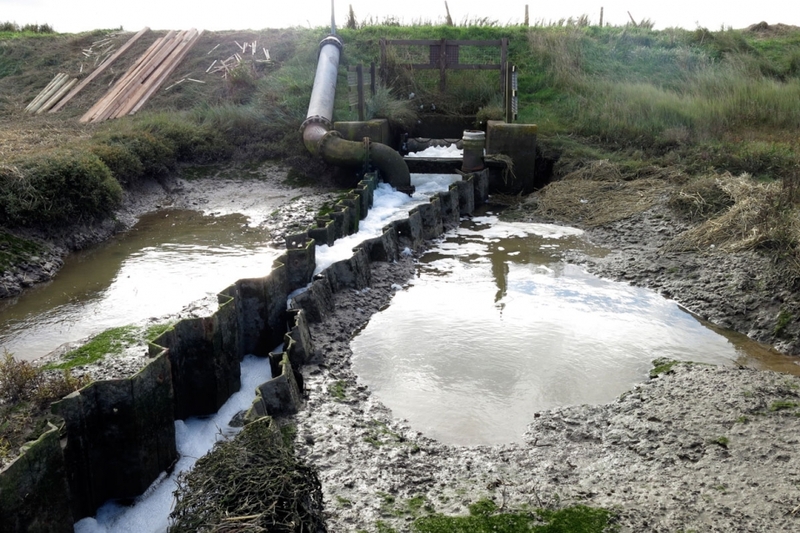 In recent years the outfall for Kings Fleet has been converted from a sluice to a pumped system with the consequence that water is evacuated at a higher velocity than previously, promoting further scour and enlargement of the channel complex in the immediate vicinity, drawdown of the saltmarsh and deepening the drains. This in turn promotes greater tidal ingress and incrementally increases erosion. 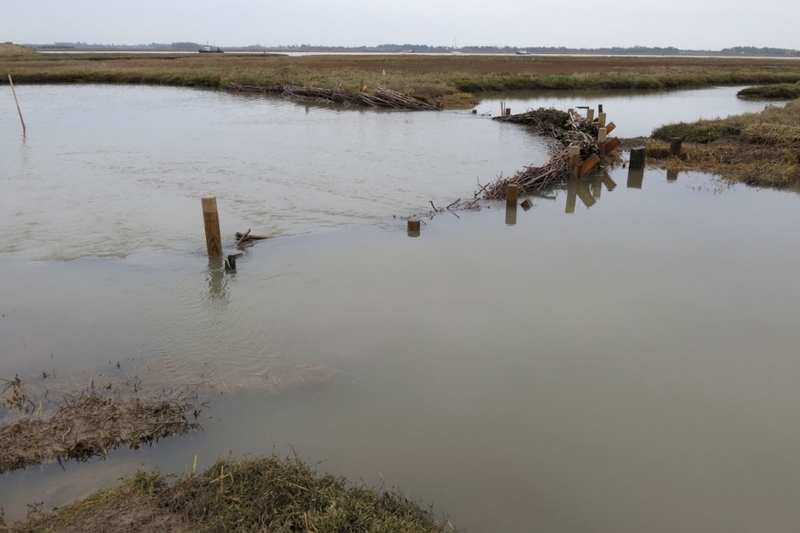 The sheet pile shuttering that directs the water from the outfall into the channel that drains into the river is collapsing and the adjacent saltmarsh is washing out. these are no longer standing water but drain separately towards the river and as a consequence are subject to regular tidal incursion via their drainage channels. These relict lagoons are lower than the surrounding marsh and have reverted to a pioneer vegetation stage. The entire frontage of the marsh is subject to erosion, many of the banks are in a state of collapse and the mouths of the drain channels are progressively widening. The leading edge of the cliff top of the marsh has lost a great deal of vegetation, which could be the result of tidal scour, wave action or boatwash. This is most evident where the cliff height between the foreshore and the crest is at its greatest (+]1.5 m) in the northern part of the saltmarsh. Although the same pattern persists along the entire frontage, this is not so extreme towards the Felixstowe Ferry end because the foreshore is higher with a distance to the crest of +]0.5m due to the protection afforded by the Horse Sand Shoal. The lower region of the marsh near Felixstowe Ferry is in a healthier state with a more consistent range of saltmarsh vegetation and has a slightly higher elevation than the upper end. However there is an increasing amount of cord grass growing in lower lagoon sections that could be an indicator of die]back of middle range saltmarsh vegetation and general failure to keep up with sea level rise. There is now only one small sluice emptying into the lower creek from the golf course. As a consequence the main cause of erosion at the lower end appears to be tidal water emptying from the enlarged channel systems within the marsh. 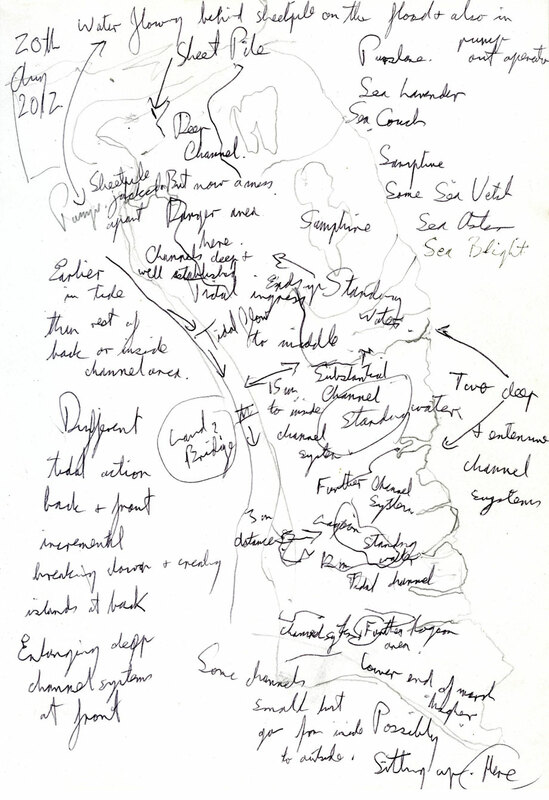 The main flow through the site on the flood is north]south and the ebb south-north due to the deeper channel system at the upper end of the marsh and the shoaling channel between the saltmarsh and Horse Sand. There is a natural watershed point for the inside channel 30m south of the derelict wooden structure placed where the final piece of marsh formed a bridge across to the main body. conservation and capture must be key to any management strategy. The area immediately inside the entrance is flood dominant. The incoming tide passes on the Bawdsey side, dropping its heavier tidal]borne sediments on Horse Sand Shoal before passing the into the marsh area as a less dynamic counter current. The lighter sediments on the foreshore of the saltmarsh could be tidally borne, however, there is also a strong possibility that this could be the product of silt washed out of the marsh. material carried out on the ebb must safeguard against the risk of it being lost to the system. It is our opinion that the outfall from Kings Fleet has had such a detrimental effect upon the saltmarsh that any management project must include a strategy for mitigating the impact of frequent and prolonged introduction of fresh water into the system at a velocity beyond that normally expected from a sluice outfall. The installation is jointly managed by the IDB and EA. We suggest that it is essential to the success of a project on the site that these two organisations accept responsibility for managing the impact of the outfall by either altering the installation or attenuating the effects of increased flow at higher velocity. Since this is a fringing saltmarsh, it does not have the capability to roll back. As a consequence, its loss will not only be a net loss of habitat, but will also have a direct effect upon the resilience and sustainability of the flood defence asset. If no management strategy is put in place, the effect of increased frequency of pumping operations and associated incremental enlargement of the tidal channels will erode the remaining areas of isolated saltmarsh back to mudflat across entire northern half of the site. The inside channel will enlarge and erosion into the body of the marsh from the back will eventually join up with the heads of the drain system, when the eventuality of tidal ingress from front to back as well as north-south between the defence wall and the marsh will cause further dissection of the marsh. The drain channel system through the entire marsh will enlarge and join up with the lagoons turning them into tidal features and lead to further loss of sediment and reduce the range of saltmarsh vegetation. This in turn will lead to further enlargement of the drains widening and deepening their channels with the result of greater velocity of water movement and further collapse of the banks. Since the source of new sediments in the system is limited, accelerated loss of material from the marsh will increase the amount of flow through the site and therefore the likelihood of it being borne out on the tide and lost to the system. The certain disintegration of this fringing saltmarsh will be a significant loss of intertidal habitat plus it will expose the flood defences to increased tidal pressure where currently it forms a first line of defence. This is therefore not a recommended option. This could be more than one option depending on whether it is considered economically justifiable to alter the configuration of the pipework. At present the proposed engineering solutions to the collapsing sheetpile gulley address the efficiency of managing the outfall but not its impact upon the fabric of the saltmarsh. Accepting the unlikely event of a radical reconfiguration of the engineering, it will be necessary to consider mitigation through the use of a soft engineering solution both in the immediate vicinity and within the channel that carries the freshwater out to the river. The channels that feed and empty the saltmarsh should have permeable barriers of willow bundles, coir and hurdles to their crest level to reduce the dynamic of tidal exchange into highly eroded area. 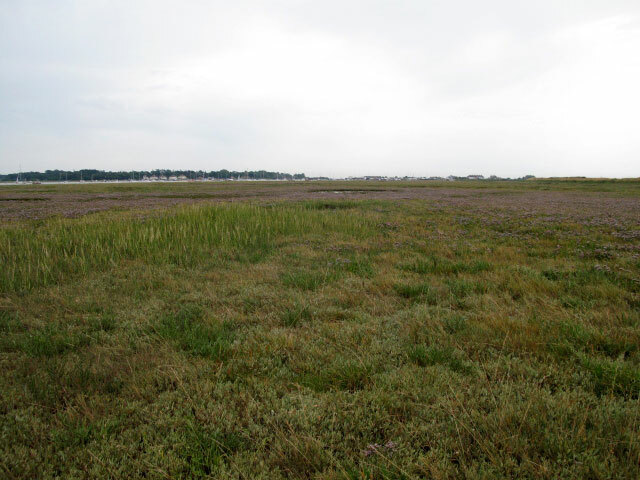 The frontage of the saltmarsh with the greatest potential for scour must be lined with similar material to reduce impact and reduce loss of sediment. There is a single substantial channel feeding laterally into the drain through which it will be necessary to reduce flow. This could be affected by placing a sill across the entrance to retain silt and possibly further structures to interrupt flow within the body of the channel. We would like to consider the possibility of a short training wall leading from the downstream corner of the marsh at the end of the channel where it meets the tidal estuary. The intention would be to alleviate the pressure on the edge of the marsh at this point and the frontage further downstream. We consider the negative impact of the outfall in its current configuration to be a responsibility that must be acknowledged by the IDB and EA and expect logistical and practical support to provide mitigation. This measure would only manage the impact of the outfall upon the intertidal habitat. It would have an immediate effect upon the flow of the tide through the marsh, but considering the size of the tidal prism, as a stand]alone solution it will cause further channels to develop and eventual failure in the system. As a consequence, our conclusion is that this cannot be considered in isolation from a wider suite of solutions across the entire saltmarsh. But it is an essential precondition to a successful management strategy for the site. 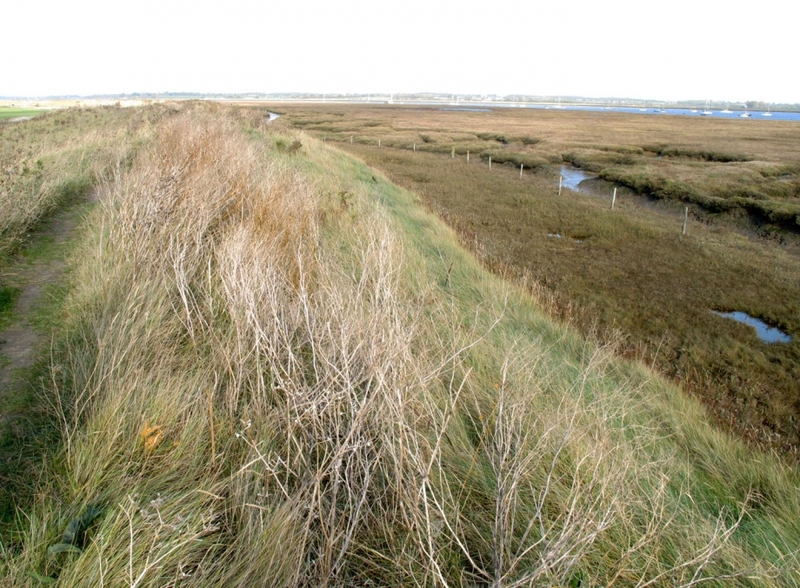 The most immediate cause of loss of saltmarsh is the north-south tidal flow through the borrow dyke. There is a watershed point approximately midway along the channel where the depth of water at high tide is at its shallowest and where the last of the ebb flows both north and south. This is approximately 30metres south of the point where the saltmarsh had once joined the land. Since pattern of erosion of the marsh is not complex at the point of the original link, it would be an appropriate location for a permeable barrier of willow bundles, coir and straw bales up to and above the crest level by approximately 30cm and extending laterally over the bank and the marsh to limit the potential for scour around the edges. A similar but more resilient structure should be placed at the northern end adjacent to the sheet pile shuttering for the outfall to close off what has become a dynamic channel system. This should extend in front of the area of marsh most immediately vulnerable to the effects of the high velocity of flow during pumping operations and should continue along the drain channel as described in the section upon managing the pump outfall. 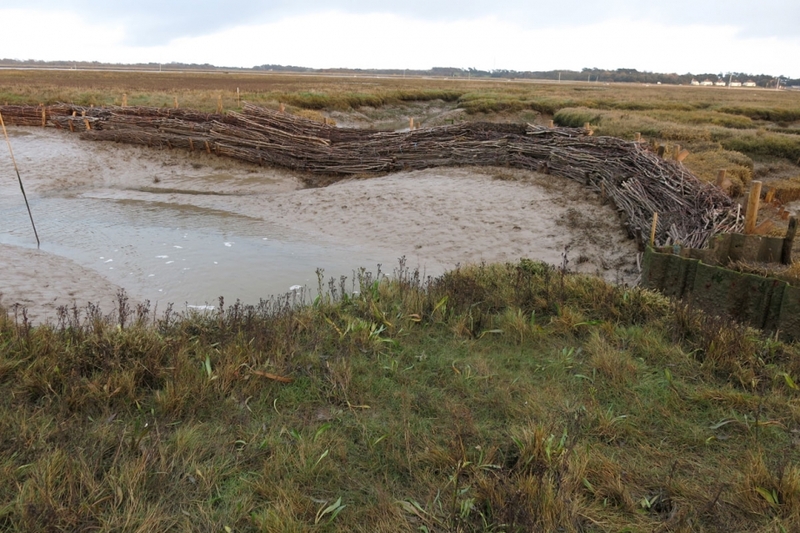 A further barrier at the southern end of the dyke: this need not necessarily be to the height of the crest of the saltmarsh but needs to be above the height of the bed of the dyke where it is at its shallowest at the centre. As such it would form a permeable sill structure where the intention is not so much to manage tidal ingress but more to retain sediment. Many of the channels that drain towards the river have become enlarged and some also extend close to the eroded areas at the back of the site. This is more pronounced towards the northern end where the heads of the channels have become enlarged to the extent that they hold a large volume of water and promote erosion on the ebb. In order to limit the threat that the drain system might join up to the eroded area, it will be necessary to establish a strategy to control the amount of tidal exchange in the most extensive channel systems and to retain sediment. Place a sill of willow fascines and coir inside the mouth of the particularly enlarged channels. Place further sills at the points where the channels split. Where there is an enlarged cavity at the head of a channel, reduce its capacity by filling it with straw bales or placing a bund across the channel at a point before it widens. Address surface flow of the tide across the site where feasible, particularly where tidal lagoons have developed channels and are now draining on every tide. Observe the direction of flow of the tide across the site and fix lines of straw bales to impede further loss of sediment upon the ebb. Although this saltmarsh possibly owes its survival to the protection afforded by Horse Sand Shoal and the diversion of both the ebb and flood towards the Bawdsey shore, there has nonetheless been steady loss along the entire frontage as evidenced through comparison of OS material from 1926 to present day, Google Earth imagery from 2007 and contemporary GPS and LIDAR surveys. A system to attenuate tidal and wave energy may be best placed at the northern end of the site where the cliff height is at its greatest and where it does not benefit from the shelter of Horse Sand Shoal. In the first instance a geogrid and brushwood fence structure extending from the downstream corner of the outfall channel could serve as a training wall to mitigate the combined impact of the pumping operation and the ebb tide and create suitable conditions for accretion of sediment at that point. If the intention is to retain the saltmarsh, do nothing is not an option, since this will lead directly to its disintegration from the combination of the unmitigated impact of the outfall for Kings Fleet, increased tidal flow through the site, the failure to keep up with sea level rise and incremental loss of material across the front of the site through tide and wave action. For any management scheme to succeed the destructive effect of the pumped outfall must be contained. If it is not considered justifiable to find an alternative engineering solution for this it should be recognised that there is a responsibility to alleviate the damage caused to the saltmarsh by direct impact and by drawdown. 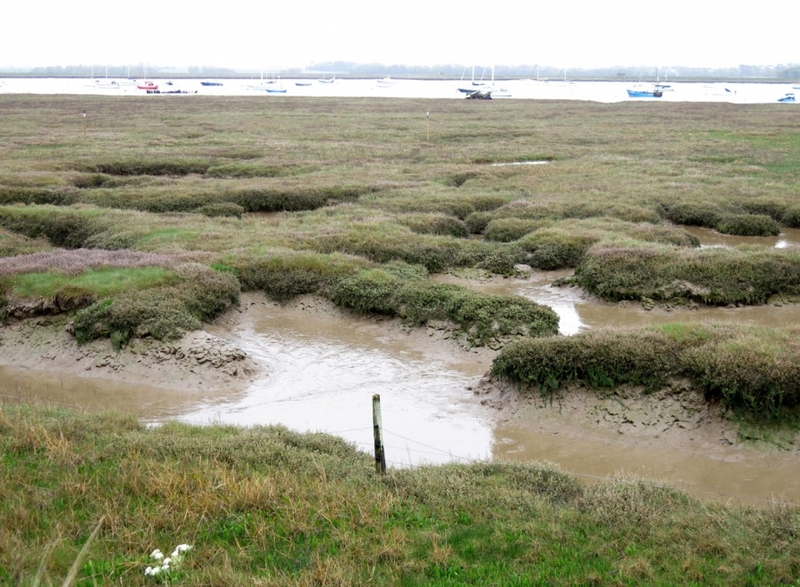 We would seek collaboration with EA to agree a management strategy for the saltmarsh in the immediate vicinity of the outfall and its main drain channel. 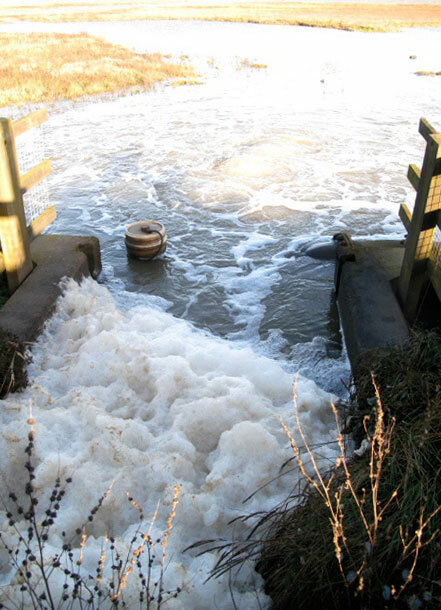 Containment of the negative impact of the outfall must be a priority in the overall management of the site. This should be considered a necessary measure combined with the management of the impact of the outfall. The amount of tidal energy in the channel systems will ensure the failure of any attempt to contain the effects of the outfall and vice versa. This proposal would certainly include the management of the borrow-dyke and those drainage channels that threaten to break through or have enlarged to such an extent to threaten the integrity of the surrounding marsh. Management of surface flow across the marsh would benefit from further research, however where there is evidence of slumping and loss of material and vegetation it might be advantageous to break up flow and prevent loss of sediment through direct run]off. I suggest a simple experiment with lines of straw bales in some of the most affected areas. Certainly there is strong evidence of loss of saltmarsh material through tide and wave action across the entire front of he site. At the northern end where both cliff height and exposure to wave action are greatest, it would seem advantageous to use a wave screen to deflect both tidal flow and wave energy. However since erosion is consistent along the entire frontage an independent scheme to build up the foreshore using willow fascines would be most desirable but possibly too expensive and in the first instance too much of a diversion from the main aim to control the effects of tidal movement through the site. There could be benefit derived from experimentally managing some of the foreshore in this manner where the impacts are obviously greatest. We propose the installation of a wave energy attenuation screen at the top corner of the marsh to manage tidal and wave energy and to act as a training wall for the outfall channel. We would like to explore the potential of controlling surface movement of the tide in areas that are at risk of further depletion through loss of vegetation and sediment through a low key intervention by staking in lines of straw bales. This will need further discussion and research. We would like to explore further the use of willow fascines to reinforce and stabilise the foreshore and alleviate the effects of erosion across the frontage of the site. We need to clarify the movement of sediment into, through and from the site in order to satisfactorily to establish a balance between encouraging tidally borne sediments to accrete, whilst discouraging further loss of material from the site through erosion.